Autumn is my favourite time of the year for style so I've been eager to add some new staples to my wardrobe. I love browsing the shops for cosy jumpers and dresses in rich earthy colours, I would live in my winter clothes all year round if I could! Primark is great at this time of year for buying cheap knitwear and tops to layer them with while New Look has a great range boots. 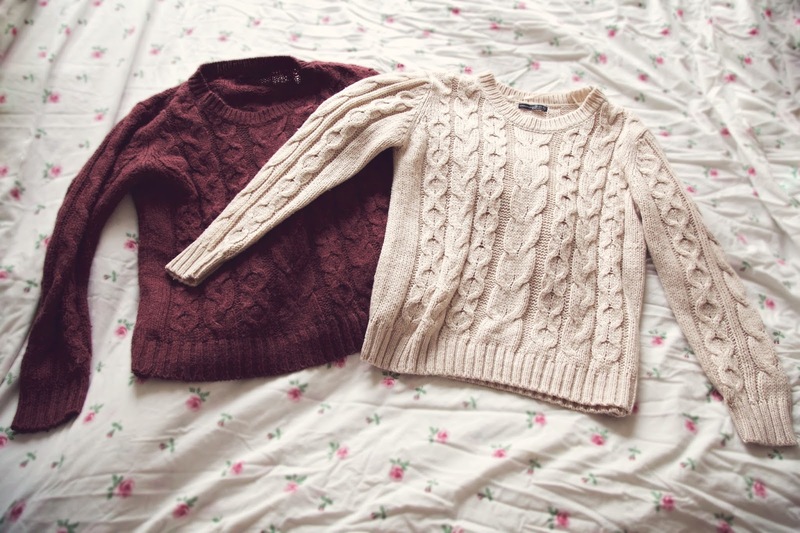 These chunky knit jumpers are lovely and thick and slightly oversized. I couldn't decide between the creamy oatmeal colour and the burgundy so I picked up both. 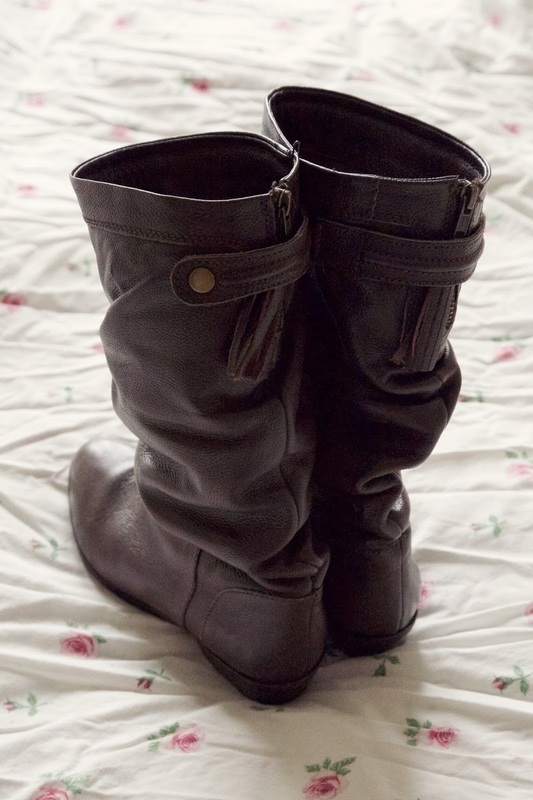 They great for wearing with skinny jeans and boots, and I like to layer mine with a gilet while it's not too cold out. My own issue is the wool blend it a little itchy, but they are still super cosy. I also picked up these long sleeved tops which are an absolute bargain - I could've easily bought a few more! 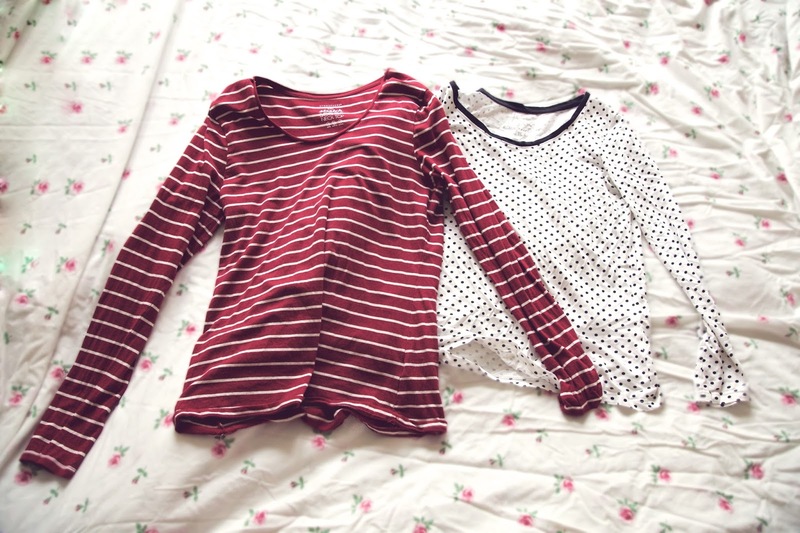 The red top with white strips is made from a soft stretchy material and slightly longer than the white spotty one which is of basic quality and slightly cheaper. 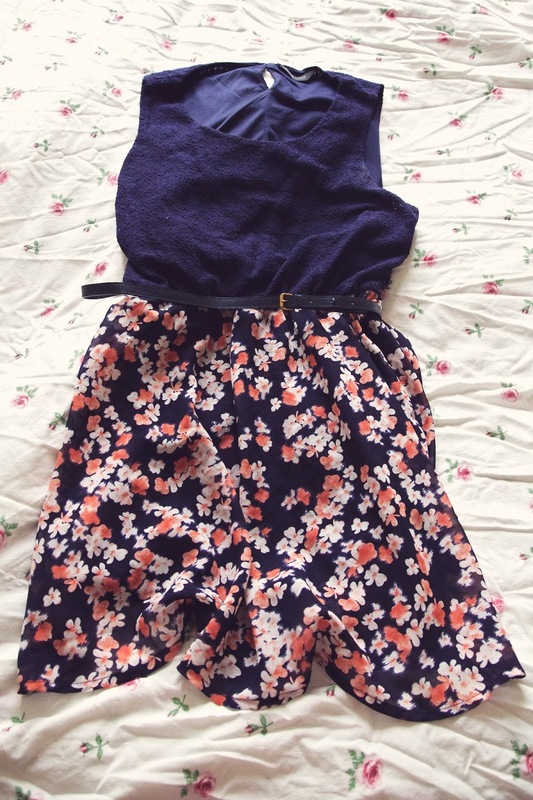 Primark had four displays of these basic tops in different styles and colours ranging between £2.00 and £4.00. I've been wearing them under black, navy and red skater skirts with a waist belt, tights and boots but the red also looks great with jeans. This navy lace belted dress with floral skirt from New Look was a bit of a treat for me to wear out to dinner for my brother's birthday (at least that's my excuse!). I really wanted an Autumnal dress to wear and this one happened to come in my favourite colour. It looks gorgeous on although it is a little big for me (which I am secretly thrilled about as it shows that I have lost weight!) so the belt helps to cinch in the elasticated waist. I promised myself this Winter that I would invest in a pair of good boots. I usually buy the cheapest boots I can find around the £15 - £20 mark and they always fall apart by the end of the season. This year I looked for a budget friendly pair of real leather boots and hit the jackpot in New Look. These chocolate brown boots have a great casual look to them (I much prefer brown to black leather) and cost me only £49.99. They have a tassel zip at the back and a popper and the leather has a texture to it that is so much nicer than faux leather. I've been wearing them pretty much none stop over skinny jeans or tights and they have been really comfortable. 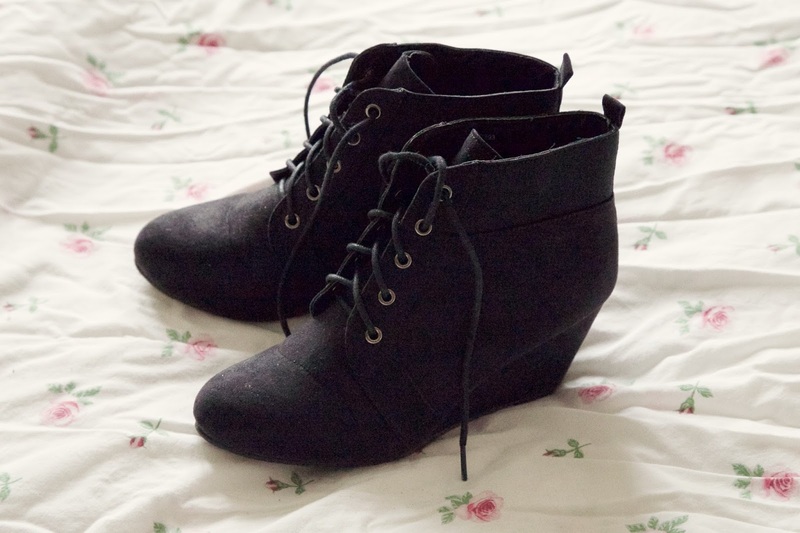 I had intended to ask for these wedge ankle boots for Christmas but I just couldn't wait. As well as my gorgeous new leather boots I wanted a slightly more dressy shoe for the season. 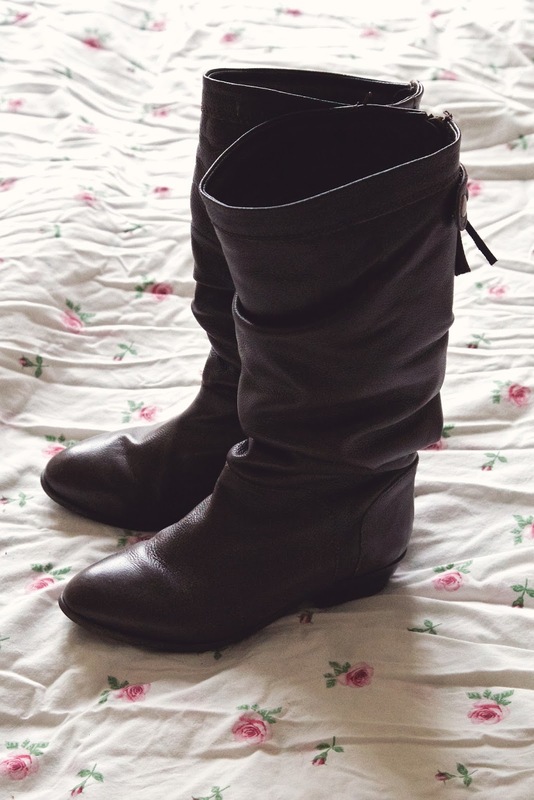 I can't walk in heels so it had to have a wedge heel and I completely fell in love with these lace up boots when I first saw them. I tried them on in the shop to make sure they fit and then added them to my wish list, but eventually I gave in and ordered them for myself online! They are so comfortable to wear and look amazing with my new dress too making them perfect to wear for my brother's 21st birthday meal. I am trying to keep my purse strings tied now until Christmas, but I'm secretly longing for a new jacket to complete my winter wardrobe! It is hard at this time of year not to long for new clothes when there are so many lovely things in store, especially as I often hate the summer fashions. Is Autumn/Winter your favourite fashion season too?